We had a great opportunity to head to Milford Lake the weekend before school started for Rebekah. Thanks so much to our friends Archie, Michelle and little Jade for letting us enjoy the lake on with a tubing experience extraordinaire! Both kids had never tubed before and had a wonderful time! Bekah had her very first day of 4th grade on August 15th. Our baby is getting so big! I made happy face pancakes to commemorate the momentous occasion. Grandmommy was here for the big day. We are so thankful to finally be close enough to have Grandmommy visit for the first day of a new school year. Bekah is attending Riley County Rural School. She is proud to be a Falcon. With all the moving, I think she is even more excited to have a new mascot! She has been a mustang, a patriot, and then a mustang again at the last two schools! Here's to 4th grade...and the adventures to come! One last important thing. We have met the most wonderful new friends: Jose, Lise, Anna Lise and baby Joaquin. They are our neighbors and new best buddies. 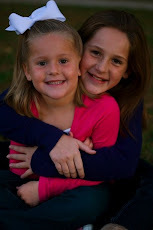 This week Savannah Kay and Anna Lise headed to the park while Bekah was in School. The girls sang ABC's on the swings, played in the water fountain, fed the geese. Even though the park was super fun, I think the highlight was goldfish and fruitsnacks for snack time! Thank you God for great new friends, a great new school close to Grandmommy, and a beautiful lake to enjoy! Life is so good!